It’s 6 p.m. on an August day, and the stifling afternoon heat has given way to a muggy evening on a sports field at St. Benedict’s Preparatory School in Newark. The grounds of the private Catholic school feel far removed from the buzz of a city in flux, and the field is quiet, until about 150 teenage boys emerge from the gym and onto the turf in an orderly rush. There, St. Benedict’s freshmen are led by 12 U.S. Naval Academy cadets through a boot-camp-style workout that’s likely the most grueling physical challenge many of the young men have ever faced. Joe Carmona, a 2017 graduate of St. Benedict’s, is familiar with the rigorous program, having gone through it a few short years ago. But today, he finds himself in an unfamiliar role. Today, he’s the one doling out commands. And while the conditioning program may seem harsh, it’s one puzzle piece of a school-wide philosophy aimed at raising leaders — a doctrine that led Carmona, 18, to pursue a career in the military, and brought him back home this summer to St. Benedict’s, where he hopes to help influence future generations. At St. Benedict’s, many students come from inner-city neighborhoods and more than 80 percent receive financial aid. Half of the student body is black and another third is Latino, like Carmona. In a world where the “bare minimum” is expected from those students, Carmona said, he would like to be a beacon of hope. It was soccer that brought Carmona to St. Benedict’s — an institution that dates to 1868. He played, but found a sense of community and camaraderie off the field that made him certain he wanted to stay. St. Benedict’s prides itself on producing emotionally mature, morally responsible and well-educated citizens. It achieves this by allowing students to essentially run the school, St. Benedict’s leaders say. Students look out for one another like family, which is especially important when some are coming to campus each day from unstable homes. Father Edwin Leahy, headmaster of the school, can relate. He came to the school as a 13-year-old student in 1959 and returned as a faculty member in 1969, going on to become headmaster in 1972. Since then, the St. Benedict’s model of education has caught the attention of schools nationwide for its student leadership program and student-run accountability system. Faculty is there to guide the students and protect them from making life-threatening mistakes, Leahy said. They work hard to instill a sense of community — something Leahy said is lacking in the United States right now. Ron Jandoli, communications officer at the school, said St. Benedict’s students come from many different places and backgrounds, including religiously. The resulting harmony could serve as an example for humans everywhere. “There’s so much strife in the world right now. If you put a group of kids together from all different backgrounds and they can get along, why can’t it happen outside these walls?” he said. In 2007, St. Benedict’s began to collaborate with the Naval Academy for a program that seemed mutually beneficial. Leahy said that although a large percentage of enlisted members in the Navy are black or Latino, that was not reflected in the officer ranks. A presence at the school might help increase the Navy’s pool of candidates. Naval Academy students become commissioned officers upon graduation. Naval Academy leadership program at St. Benedict’s Prep School in Newark, NJ. 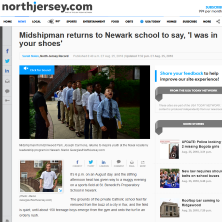 Cadets, or midshipmen, as they’re called in the Navy, have come to St. Benedict’s each summer since, teaching leadership skills to students and running a physical training program for incoming freshmen. Carmona hadn’t considered joining the armed forces until he went through the program. Though Carmona described his plebe year at Annapolis as challenging — “like putting a fire hose to your mouth and trying to take a sip” — he felt prepared because of the structure, discipline and kinship fostered in him at St. Benedict’s. Carmona, now a sophomore, hopes to become a Navy pilot and then put his political science major to use. That’s music to Leahy’s ears. His hope is to instill in students — especially minority students — that they can learn to work together to influence a country that’s currently “hostile” for minorities and immigrants.